The Olivier Music Barn on a summer day. Photo by Erik Petersen. 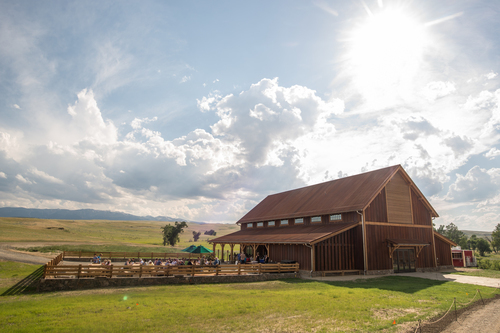 In early January of this year, Tippet Rise received a great honor: LEED® Gold certification from the U.S. Green Building Council (USGBC) for the Olivier Music Barn’s environmentally sustainable design and systems. LEED, which stands for Leadership in Energy and Environmental Design, is a certification program developed by the nonprofit USGBC to assist in the design, construction and operation of green buildings, homes and neighborhoods in 165 countries and territories around the world. In 2010, the art center’s founders, Peter and Cathy Halstead, and the inaugural director of Tippet Rise, Alban Bassuet, began work on the master plan for Tippet Rise, guided by the international design and engineering firm, Arup. At the edge of the Absaroka-Beartooth Wilderness, the 12,000-acre art center provides critical habitat to native flora and fauna. Awareness of the role the Tippet Rise land plays in the greater ecosystem helped to shape the master plan as did the USGBC’s LEED guidelines. The Olivier Music Barn, Will’s Shed and the artist residences on the Cottonwood Campus at Tippet Rise. Photo by Erik Petersen. 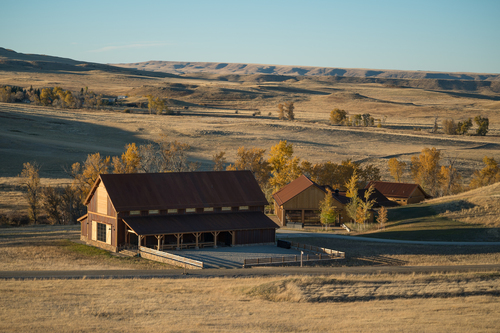 The Cottonwood Campus serves as the operational hub of Tippet Rise and the Olivier Music Barn sits at the heart of the campus. It is here, within the barn’s larch walls, that Friday and Saturday evening concerts are performed, recordings are made, films are screened, and Shakespearean dramas unfold. In addition to the Music Barn, the Cottonwood Campus is home to the Tiara Acoustic Shell, Will’s Shed, and three artist residences. It is also the future site of a Francis Kéré-designed outdoor pavilion, opening in summer 2019. Like the other buildings on the Cottonwood Campus, the Olivier Music Barn’s standards of sustainability include low-carbon emissions and near-net-zero energy consumption: a 78% energy-use reduction, in the barn’s case. All buildings on campus are heated and cooled with a geothermal system, while 8,000 square-feet of solar panels provides electricity to the buildings and vehicles. A graywater system collects runoff from the Olivier Music Barn’s roof and from atop the solar array, as well as from five acres of land surrounding the barn; this water is stored and then used for indoor non-potable and irrigation purposes. Landscaping across the campus, with a diverse mix of drought-tolerant native plants, also reduces the art center’s water use. For example, the LEED system also evaluates the environmental impacts of the materials used to construct a building: in other words, LEED takes into consideration how the “ingredients” of a given building material were extracted or manufactured, transported, and other steps within what is called the material’s production “lifecycle.” LEED encourages use of “environmentally preferable” materials, part of the goal being to help stimulate market demand for such products, from responsibly-harvested wood to paints that are low in volatile organic compounds (VOCs). Human health is also a key consideration in the LEED certification process; post-construction indoor air quality, thermal comfort, access to daylight and outside views are among the LEED criteria. The solar array at Tippet Rise. Photo by Liz Stetson. • The Olivier Music Barn and the rest of the buildings on the Cottonwood Campus use 100% electricity for heating, cooling and power needs. 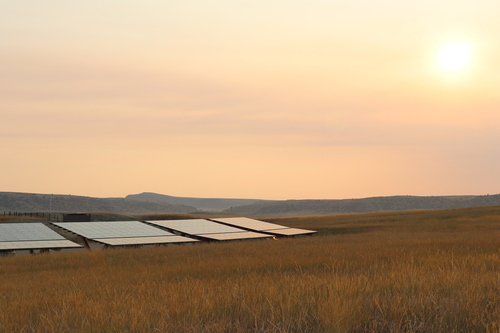 The solar arrays at Tippet Rise are sized to generate 65% of the electricity used by the buildings on the campus; they also provide a free charge for electric vehicles driven to Tippet Rise by visitors. • With the barn’s energy-efficient design and systems, the project achieves an energy cost savings of 78%. • By each spring, more than 100,000 gallons of snowmelt and rainwater have been collected and is stored beneath the parking lot adjacent to the Olivier Music Barn. By using collected surface water, Tippet Rise is able to reduce its reliance on aquifer water by 80%; this includes a 53% reduction in the campus’ average annual irrigation. By using high efficiency fixtures and an innovative waste water system, total water consumption in the barn has been reduced by nearly 30%; consumption of potable water has been reduced by 82%. • Geothermal heating and cooling harnesses the stable earth temperature of 55 degrees to pre-heat or pre-cool water before it is sent to the buildings’ heating and cooling systems, further reducing energy demand. We at Tippet Rise would like to thank all of the art center’s staff members and contractors who worked so hard throughout the USGBC’s rigorous certification process. We would also like to thank the USGBC for their leadership and vision in promoting environmentally sustainable building practices around the world. Finally, we would like to thank the many people who advised us in the construction of the Olivier Music Barn (listed below). Your help and wisdom are indispensable to the sustainability of Tippet Rise. 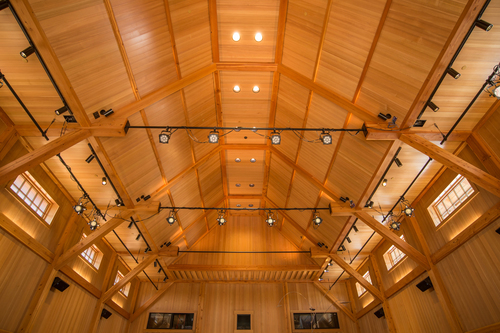 Natural light suffuses the concert hall in the Olivier Music Barn; the larch-lined ceiling and walls add to the warmth. Photo by Erik Petersen.